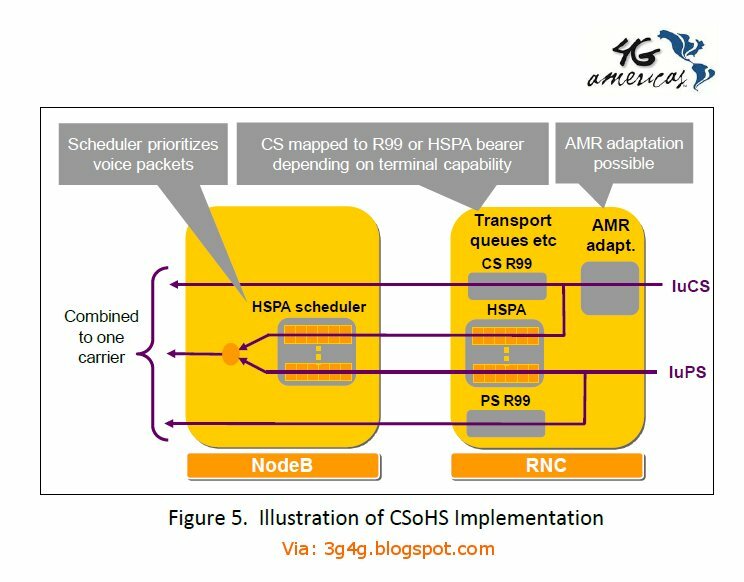 I have blogged about Semi-Persistent Scheduling (SPS) and Transmit Time Interval (TTI) Bundling feature before. They are both very important for VoIP and VoLTE to reduce the signalling overhead. 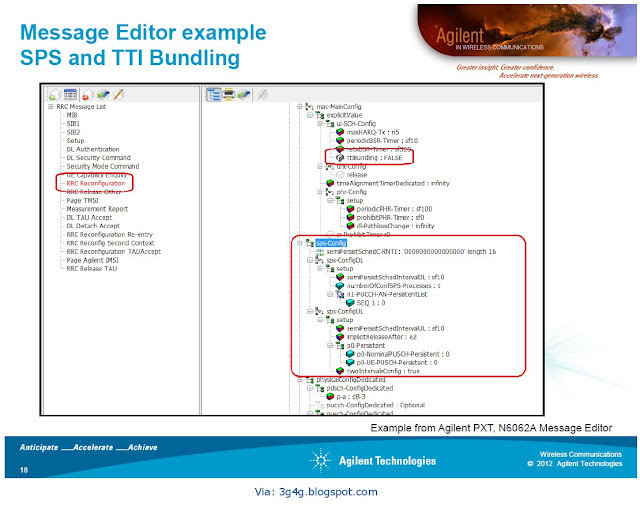 TTI bundling can be enabled for FDD and for TDD only for configurations 0, 1 and 6. 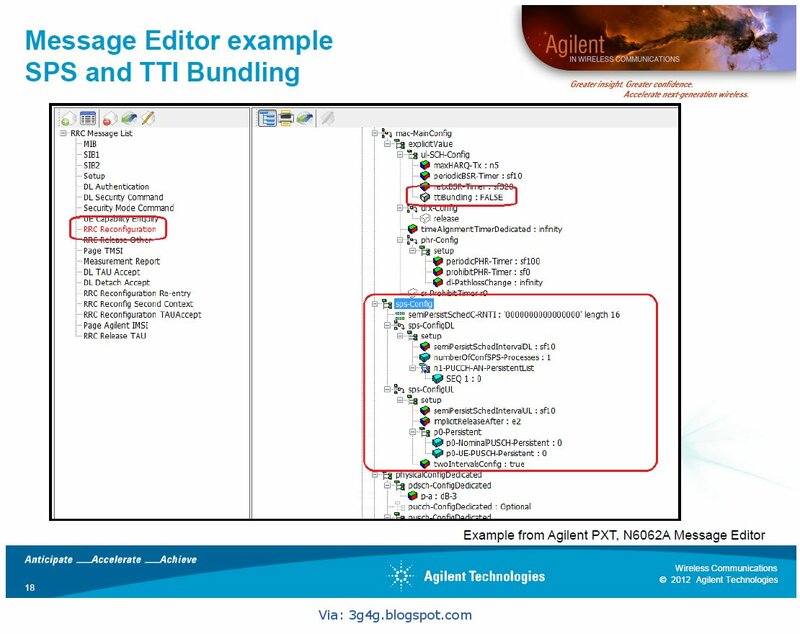 For TDD, E-UTRAN does not simultaneously enable TTI bundling and semi-persistent scheduling in this release of specification. Furthermore, E-UTRAN does not simultaneously configure TTI bundling and SCells with configured uplink. View more presentations from zahidtg. Interesting article summarising the Voice issues in LTE from Total Telecom Magazine. View more documents from zahidtg. The complete issue of the magazine is available here. How to avoid network choking in the future? If you are looking for an answer to this question then you wont find an answer to that here. Probably no one really knows a complete answer to this question right now. A simple answer would be to have a mix of the Macro cells, Micro cells and Femtocells with some way to offload some more traffic via WiFi. Earlier this month Skype announced that its client would be able to work on most Symbian phones. I have used the Skype client on phones from '3' and they work great. Skype is even available on iPhones and they were downloaded 1 million times in the first couple of days. Now a big chunk of operator profits come from long distance calls and calls when abroad. If we all start using our phones with Skype, its going to bite into the operators profits. That means they will have to recover this profit from us by another way. Skype on phones will be used in always on mode, meaning that the networks will get loaded and get congested. A simple solution is to have Femtocells at home that can offload the traffic on Internet. These background apps do cause a considerable amount of traffic and recently an Operator blamed the apps for its network woes. Femtocells have been targeted generally at the residential market with developments going on for Business users as well. Another smaller Picocells and Microcells are also easily and cheaply available nowadays. With the Ad-Hoc deployment of all these smaller cells, Self Organising Networks (SON) may have a big role to play. What happens where there are multiple networks present in the same place via these smaller cells? Can the back-haul not get congested because of these multiple networks which may be lying Idle most of the time? How would these impact other services that we use on our PC's? 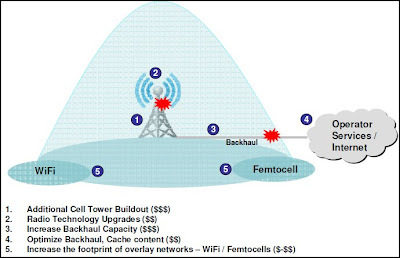 These questions can be easily answered if a single Microcell/Picocell/Femtocell was able to work for Multiple Networks. Practically this may not be possible right now because each network has a different Authentication and Security arrangement. At least we can start thinking and working on these problems while we still have time. When its too late, we may have to come up with workarounds. These workarounds only cause more headache in the longer term. 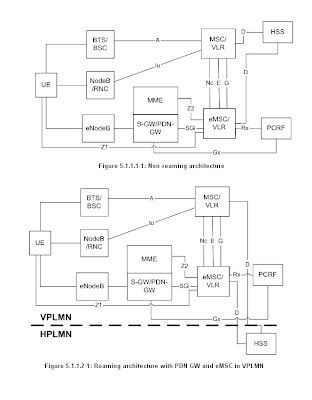 One of the Release-9 items is "Study on Circuit Switched (CS) domain services over evolved Packet Switched (EPS) access" which is described in 3GPP TR 23.879. Martin Sauter has already done some analysis on this topic so I would advice anyone interested to read it on his blog here. As we know, IMS was introduced in Rel 5 but even till today, there has been no major IMS rollouts. There are some operators working on deploying the IMS solution but in reality its not been as successful as it should have been. 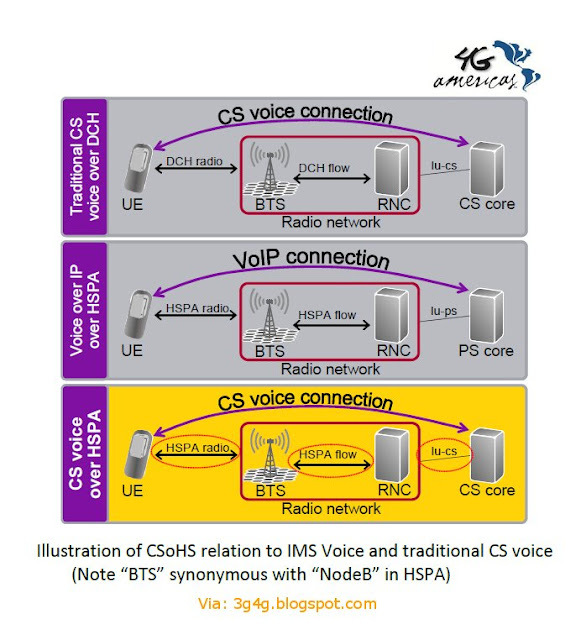 If IMS is available then the problem of voice call on LTE goes away. 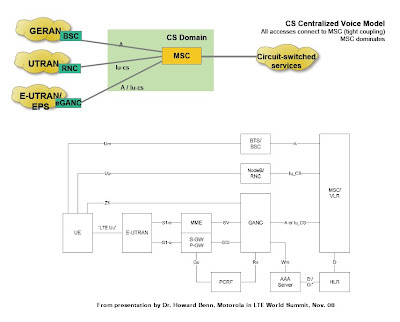 The problem can be solved using Voice Call Continuity or VCC. 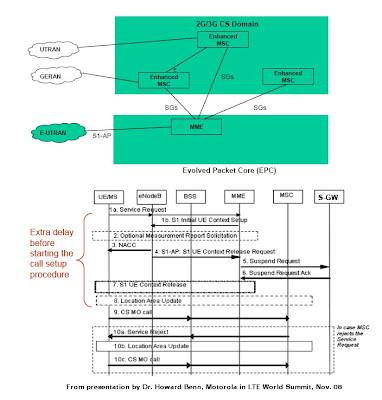 Infact there is a bunch of specifications on IMS Centralized Services (ICS) and network Centric VCC for solving this and other similar problems. So with IMS not being available, the first alternative for this problem is Circuit Switched Fallack (CSFB). In this, as can be seen from the MSC above, the user is attached to an LTE network. MSC can send Paging to the UE and if the user accepts the voice call then he is handed over to 2G/3G network. The big problem with this approach is additional time required to establish the voice call and the PS services might get disrupted, depending on how its handled. The second solution is to have a Generic Access Network (GAN... previously known as UMA) based solution. This is similar solution to the ones used by some Femtocells. This would mean that the UE's would require GAN chipsets and GAN is known to be power hungry so it can impact the battery life significantly. 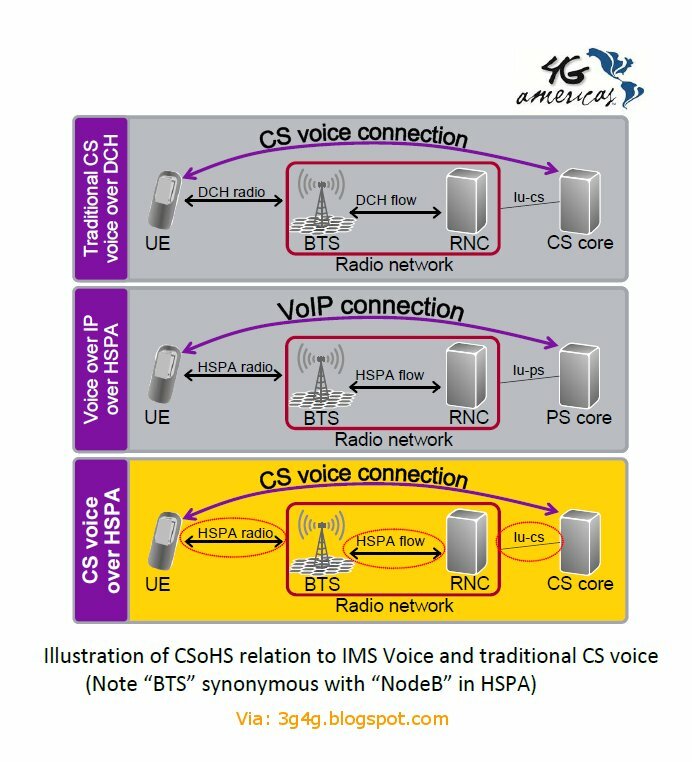 China Mobile's, Bill Huang in a recent interview mentioned that “We could carry voice over UMA” and “We will have an LTE network that supports voice…”. He was referring to this approach mentioned above. Finally there are always proprietary options like Skype that can be used along with the data services to solve the voice problem. Infact a service like Vonage, modified for mobiles, can solve this problem easily. You can connect a VoIP client from your phone or device to Vonage and you are given a landline number that you can pass to others. When calls are received on this number, the client in the mobile rings and you answer the call normally. Nick Yamasaki from KDDI mentioned that KDDI will roll out LTE with CS fallback option for voice initially but then SRVCC (Single Radio VCC) solution will be adopted in future. Even though India supplies the world with software and IT engineers, till now it was not possible for people living there to fully use VoIP facility. It was illegal to call any phone using the computer. This is about to change at the Telecom Regulatory Authority of India (TRAI) has proposed that people be allowed to make calls using internet to fixed lines. What does it mean for the people? Well, the price of domestic long distance calls is supposed to halve to less than a penny (just over a cent) and international calls are supposed to get cheaper by 20%. It would also become cheaper for people to call India from abroad. Already in UK, Vodafone is allowing people to call India from a Pay as you talk phone for just 5 p per min. This may also help the Indian call centres as right now, the onshore companies have to pay termination charges when the calls get routed to India. This would mean that Indian call centres may become cheaper and more competetive. Now for the small print; only the ISP's will be permitted to compete with the telephone companies using this VoIP. The fixed line and the mobile operators are up in arms about this because the ISPs are going to get free money whereas the mobile operators had to pay license fees for entry into the market. This may not be a big problem for the time being as at the moment India only has around 5 million broadband subscribers whereas there are 287 million mobile subscribers and around 40 million fixed line subscribers. Also, the call rates are so cheap that additional investment in a PC and broadband connection (which is comparatively expensive) may not be lucrative. If the recommendations by TRAI are accepted, there will surely be a VoIP revolution in India. The existing fixed line and mobile operators will have to come up with some challenging billing models to survive in future. According to a report entitled "Demand for VoIP increasing worldwide", Global revenues from IP telephony sales grew to $6,908 million (£3,383 million) in 2006. Western Europe formed the largest base of subscribers to these VoIP services, producing income for supplier amounting to $2,639 million (£1,292 million). Senior analyst of Point Topic John Bosnell suggested that the increase in revenues had been prompted by more customers taking up 'triple-play' service bundles which feature VoIP, broadband and TV in one package. Asia Pacific was not far behind with USD 1.75 billion and North America with 2.41 billion revenue. Monthly ARPU was highest in North America at USD 20, followed by Western Europe and SE Asia with USD 15 each and the Asia-Pacific and Latin America with USD 10 per month each. Dean Bubbley in his new report says that evolution of mobile VoIP will rapidly eclipse voice over WiFi and become a mainstream form of communication. The analyst firm predicts that the number of VoIPo3G users could grow from virtually zero in 2007 to over 250m by the end of 2012. This is comfortably in excess of the expected number of FMC users with dual-mode VoWLAN/cellular phones. 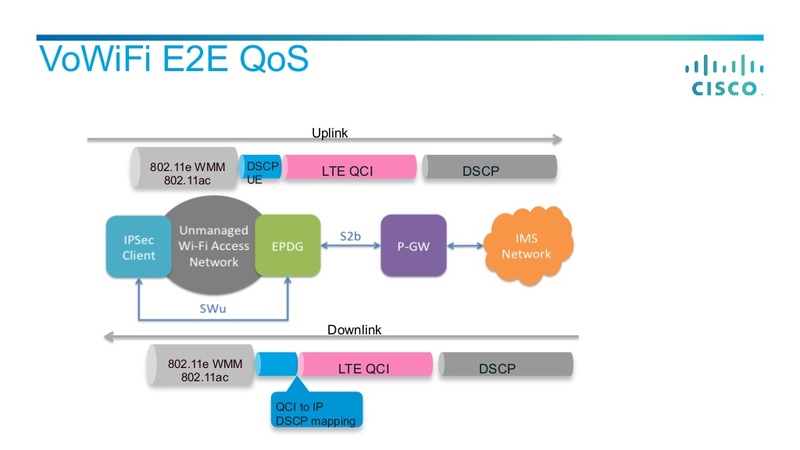 Basically LTE mandates VoIP - unless operators want to continue with a parallel circuit GSM or UMTS infrastructure in perpetuity. 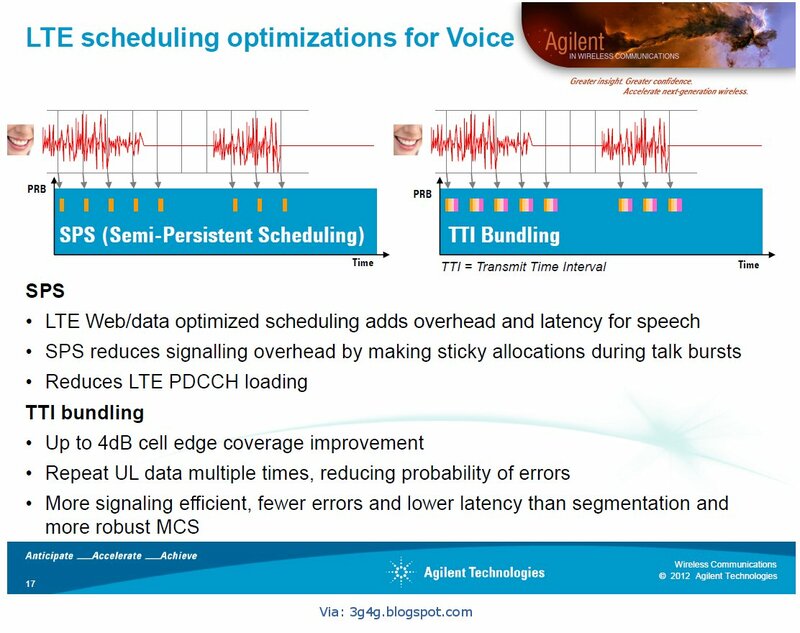 LTE-VoIP also the possibility of much higher spectrum efficiency for voice (in calls/MHz/cell) which is economically attractive given competition for spectrum & declining voice prices. 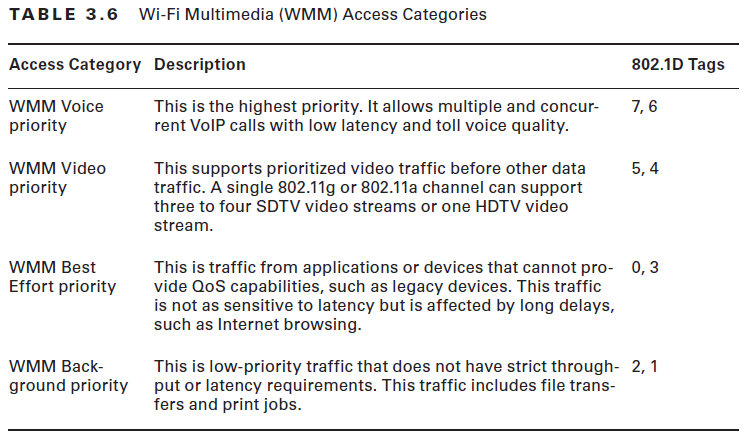 It's also in the NGMN specs. There's also issues like dependency on IMS, and whether operators want to simultaneously roll out a new radio tech (LTE) and transition their main revenue-earning service to VoIP - or if it makes sense to get some mobile VoIP experience before LTE rolls out. I think we'll see a lot more 3/skype type partnerships as 'toes in the water'. 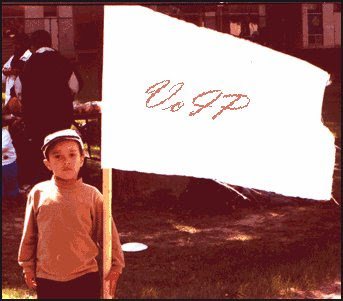 this Taiwan operator-led VoIPo3G service as an early example. Probably worth saying as well that I'm not expecting all of an individual's telephony traffic to transition to VoIPo3G. Out of 3.5G coverage, it'll flip back to GSM or circuit UMTS for example, or might be WiFi indoors. 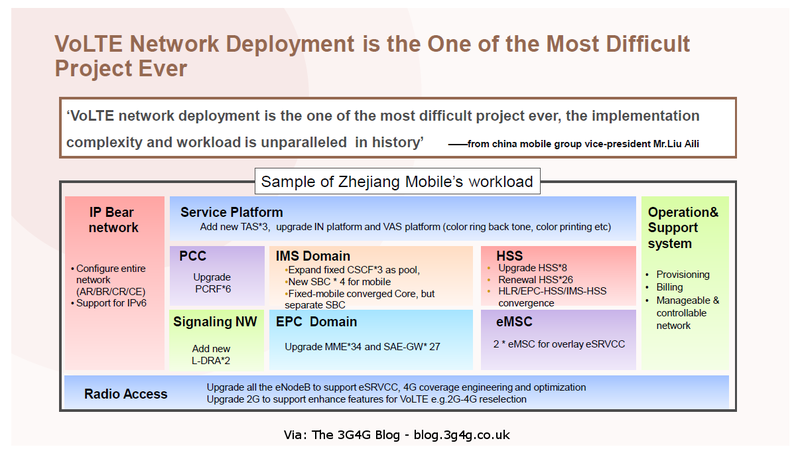 My view is that overall, VoIPo3G is more important than VoWLAN. The obligatory 'big number' headline is 250m users by end-2012 (ie about 7-8% penetration of global mobile subs and perhaps 20% of global 3G+ subs), mostly driven by the operators' own VoIP services.That's against my expectations of a low single-digit % for VoWLAN penetration. There's a lot more granularity but I'm not going to delve into it here now. While VoWLAN has been qualitatively very important, the actual quantitative usage is really small. I don't see dual-mode phones or services being that prevalent for most operators. They're just too complicated to get right at a software level, because of the variety of ways in which WiFi is deployed (eg widespread use of private WiFi with its own security mechanisms). Whilst there's been a lot of work done over the last 3 years, most VoWLAN still has a lot of compromises. I reckon that the same amount of work on VoIPo3G will yield more tangible results for both independent providers and the carriers themselves. It should also fit quite nicely with other trends like femtocells and mobile voice mashups (ie embedding VoIP in other applications). It can also be hidden "under the hood" so the user just sees a normal phone service - and therefore should be easier to integrate with things like prepay servers. Not everyone agrees though. According to Russel Shaw, "At least not in North America, continent of my residence. Based on behavior patterns that significantly proceed VoIP, entrenched cell carriers will go to all marketing, regulatory, legal, lobbying and statutory costs to protect the current business models they believe are necessary to protect their investments in networks as they are now." In other news, according to Yankee Group, the market for mobile internet services remains largely untapped, according to industry analysts which claim that operators and service providers could be raking in as much as $66bn per year, instead of the $9.5bn they are taking at present. Yankee Group warned that the full extent of the mobile internet services opportunity remains unexploited because service providers and their technology partners are not overcoming barriers to adoption quickly enough. Finally, there is a warning for all VoIP users that the flexibility and openness ofSession Initiation Protocol (SIP) have made it a key building block forvoice-over-IP (VOIP) services, but SIP also makes carrier and enterpriseVOIP networks vulnerable to crippling attacks that could bring servicesdown for days, according to the latest report published by Light Reading'sVOIP Services Insider (http://www.lightreading.com/entvoip), a subscriptionresearch service from CMP's Light Reading (http://www.lightreading.com). SIP is subject to the same types of attacks -- including viruses anddenial-of-service (DOS) attacks -- that affect email communications, but asuccessful attack through SIP is likely to have a larger impact on theaffected network, notes Denise Culver, research analyst with LightReading's VOIP Services Insider and author of the report. "SIP enablesvoice traffic to traverse VPNs, potentially carrying with it all of thethings a hacker might want to attach to such a message," she says. "Whilethose in the email security world have had more than a decade to contendwith these issues, SIP security vendors are trying not only to address theissue of securing SIP messages but also to ensure that SIP can successfullytraverse a firewall at all." A big part of the problem with SIP is that vendors have rushed productsinto the market that don't make use of all the security measuresrecommended in the protocol standard, Culver adds. The standard'sflexibility is also an issue in making networks vulnerable to securitybreaches, she says: "Until vendors reach a point at which interoperabilityis not just a requirement but actually something they recognize in terms ofthe security it provides across SIP itself, the protocol will remaininherently flawed." 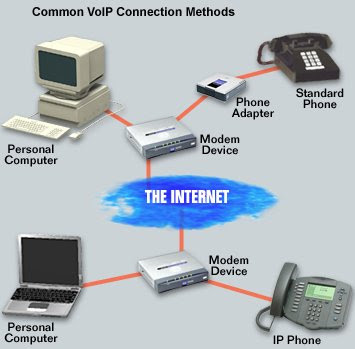 People who have used VoIP calls to make international calls will no doubt no the number of option available nowadays. Yesterday '3' released a VoIP phone in conjunction with Sykpe. While this will definitely be a boon for a lot of people, it makes me wonder how many similar deals will be coming soon. An analysis in Register says, 'VoIP is Dead. It's just another feature, now'. Think of Skype as a kind of parasitic virus that threatens to bring the host to its knees - but which can't survive without a living host. Bloggers and mainstream newspapers are another good example. Well, Skype has no network of its own - it's simply an open protocol (SIP is more than one protocol, but bear with me) wrapped up in some proprietary bits. Apart from a few authentication servers, its only real asset is its "brand" - which isn't the most concrete or tangible line item to have on your balance sheet. So at bottom, Skype needs somebody's else's network on which to operate. And because Skype has next to no income, and because its users can melt away as rapidly as they joined, it has no chance of attracting the capital investment needed to build a real network of its own, either. (This is a problem for the entire VoIP sector - how do you attract capital when the price of the product itself is tending to zero? Only a fool would possibly see this as a good investment. Fortunately for Skype, it found its fool in the shape of Meg Whitman of eBay, who was dazzled by the Swedes' "front loaded" [translation: fictional] business plan). All this means is that Skype is a kind of freestyle MVNO (Mobile Virtual Network Operator) - only without any contractual commitments, and utterly dependent on the generosity of hosts to permit it to operate. This isn't a problem when the access network is a commoditised and unrestricted internet connection - such as the home or the office network. 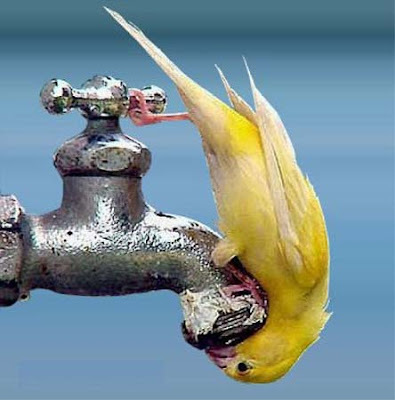 But it's a huge problem when the user is out and about - because there's no ready host for the parasite to attach itself to. So today Hutchison Wampoa, which owns the 3 networks, called Skype's bluff. Hutchison has been pushing VoIP to the trapdoor for a while now. 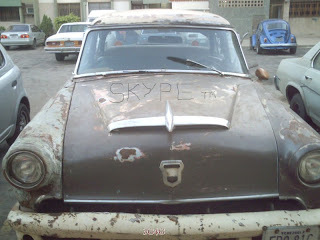 It recently killed the alternative "host" for the Skype-organism, by blowing away the business model for public Wi-Fi. 3 UK's excellent high-speed HSDPA network blankets much of the country - and you can access it from a laptop with a monthly tariff that's about the same as the price of an hour's Wi-Fi. If you're already a 3 subscriber, the network will throw in a USB dongle for free. If you need mobile data, you'd be bonkers to sign up to a Wi-Fi plan. The bigger operators, such as Vodafone, T-Mobile and Orange, have all taken flak recently for alleged hostility towards customers using VoIP on their networks. Now, here comes 3, not only encouraging its customers to use VoIP, but bending over backwards to make it easy for them. That this initiative is being taken by 3 is no coincidence, of course. As the smallest and newest of the UK mobile operators, 3's best hope for growth is to disrupt the status quo wherever it can. 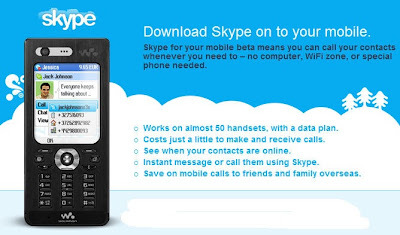 In the short term, 3 may be able to use the Skype phone effectively to boost its subscriber numbers. In the long term, though, if 3 is successful with the Skype phone, the X-Series and similar projects, it might end up creating its own strategic problems. Imagine the scenario: on your mobile phone you use Skype for phone calls, Hotmail for messaging, Google for search and directions, YouTube for TV and music. What do you need your mobile operator for? The answer could turn out to be: subsidising phones, carrying data packets, and dealing with problems & complaints. Does that add up to an attractive business? Whatever the case, VoIP is no longer an 'it' term and maybe the next time i am upgrading the phone, i may think of getting one with VoIP hotkey on it.